Our sparkling pool with children's splash zone and sandy volleyball area is the ideal spot for the entire family to unwind and play. Our comfortable guest rooms are the perfect place to unwind after a day exploring Orlando. 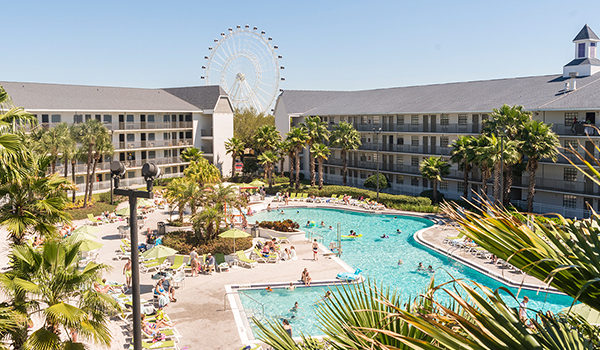 Central to theme parks and across from I-Drive attractions and dining, there is something for everyone near Avanti! The Orange County Convention Center is within walking distance, Avanti International Resort is a popular choice for business travelers. Enjoy a comfortable stay in our spacious rooms, which feature plush bedding, contemporary furnishings, and flat-screen TVs. Stay in a Premium King Jacuzzi room to relax after a busy day. Avanti International Resort offers plenty of on-site amenities as part of your resort fee, including complimentary parking. Play a game in the arcade, enjoy a meal at our restaurants, or work up a sweat in the gym. The deepest discounts are always with us when you book direct. We offer a variety of discounts throughout each season. Find the one that suits you best on our special offers page. Stay in the heart of everything fun in Orlando at Avanti International and get our best rate guarantee when you book direct with us. Our Book Direct & Save More deal offers 45% off our standard rate plus breakfast for 2 each day of your stay! Our oversized, zero-entry pool offers something for everyone, with cascading waterfalls and spraying fountains that kids will love. Relax poolside on a lounge chair and enjoy a refreshing beverage from our Pool Bar. Calling all foodies! It’s time to get ready for the ultimate global feast known as Disney’s Food & Wine Festival. Starting August 30, 2018. Avanti International Resort today announced it now has a place in the TripAdvisor Hall of Fame by receiving its 2018 Certificate of Excellence award.